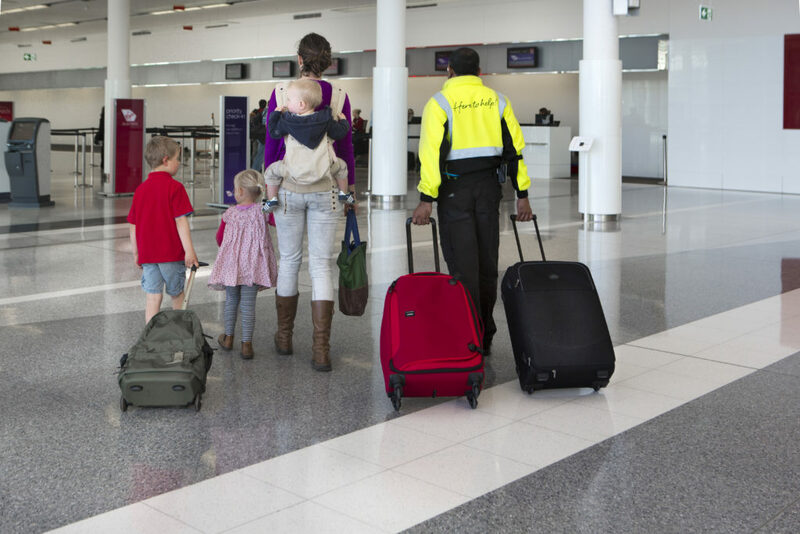 Canberra Airport is committed to providing a terminal that is readily accessible by all members of the community. If you require special assistance or wheelchairs when departing or arriving, please contact our customer service team in advance on 02 6275 2226 to make the necessary arrangements. When making your travel arrangements it is important that you advise your airline or travel agent of any special assistance that you may require. The airline or travel agent can then make any necessary arrangements, for example book a wheelchair or reserve a specific seating requirement for a guide dog. You may be required to obtain a medical clearance and fill a medical clearance form that should be presented at check-in. Passenger drop-off is kerbside on the upper level of the road system. This is the departures level and provides easy access to the check-in hall. Road ramps along the drop-off assist people with mobility impairment to the pavement. Due to security restrictions, vehicles must not be left unattended on kerbside at any time. Accessible parking is available in all four car parks and is located at the closest point to the terminal entrances. The pay machines have been designed for people in wheelchairs to easily use, however if you experience any difficulties with the ticket or pay machines, press the help button and a customer service team member will come to your assistance. The taxi rank is located on the ground floor of the road system. It is staffed by taxi commissioners during peak periods who are able to arrange a Wheelchair Accessible Taxi (WAT) upon request, although it may be a short wait. A pre booked service for a WAT vehicle can be arranged in advance through a taxi network. Transport Canberra’s ACTION buses offer a regular service to the terminal. The bus stop is located kerbside on the ground floor, on your right when you exit the terminal. For information on accessible travel on ACTION please visit their website. All passengers and visitors accessing the departures concourse are subject to security screening. The security officers at Canberra Airport are fully trained in special screening methods for persons with disabilities or special needs. If you require any special assistance then it is important that you advise staff of this prior to screening. If you are in a wheelchair, a hand-search will be required. A private screening area is available for use upon request. The terminal is fitted with multiple lifts and escalators for ease of access. Hearing loops have been installed at boarding gates, baggage claim belts, check in counters and in retail areas. The terminal also features disabled toilets; tactile ground surfaces; flight information displays; televisions with text captioning; and public telephones with teletypewriter (TTY) capability. Our passenger boarding bridges are equipped with lifts so people with mobility equipment can access aircraft with ease. The airlines will provide passengers with special assistance as required. Special boarding and disembarking arrangements can be made at the time of booking to ensure a stress-free journey. More information for mobility impaired users of Canberra Airport can be found in the Canberra Airport’s Disability Access Facilitation Plan.